After the recent mid-cycle updates to the standard S-Class range, Mercedes Benz has gone to work on the range-topping Pullman as well. Apart from the refreshed LED headlights and bumpers from the standard Mercedes Maybach S Class, the Pullman receives a new, more opulent front grill. This has been inspired by the Vision Mercedes Maybach 6 concept shown last year at the Pebble Beach Concours. Rounding off the exterior changes are the 20-inch wheels in 10-hole design and a new optional two-tone paint scheme. 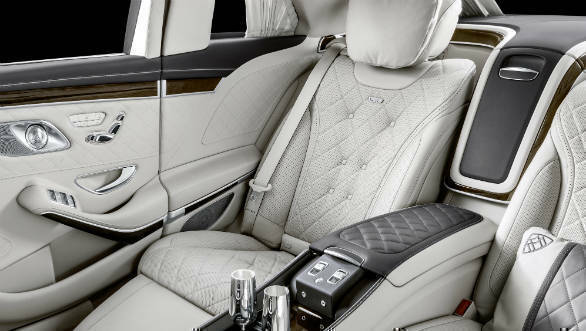 2019 Mercedes-Maybach S650 Pullman comes with 4 individual seats facing each other. The major change to the interior in this refresh is the addition of three new colour options exclusive to the Pullman - magma grey, mahogany brown and silk beige/deep sea blue. The 6.5m long ( about 1m more than the regular LWB S Class) car retains its partitioned interior with four individual seats facing each other. A front view camera has been added to the still particularly luxurious rear seating area, so as to give the rear passengers a view of the road even with the partition up. On the engine front, the Mercedes Maybach S650 Pullman carries over the 6.0 litre bi-turbo V12 from the range topping S-Class. This makes 639 PS of power, a massive 100 PS more than the last S600 Pullman, and a 170 Nm uptick in torque to 1,000 Nm. This allows the car to get from 0 to 100 kmph in 6.5s while the top speed can be expected to be limited to 250 kmph. 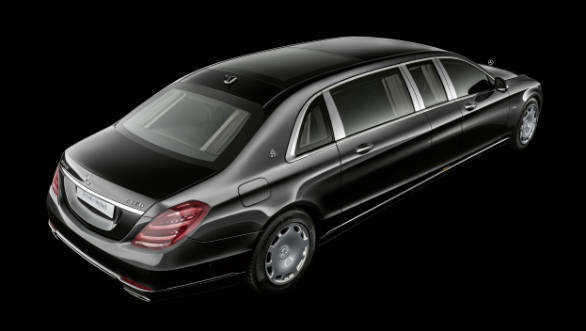 Starting at a price of EUR 5,00,000 (roughly INR 4 crore) excluding taxes and duties, the S650 Pullman is the flagship of the Mercedes luxury car range. The S650 Pullman's rich interior and capable powertrain should make it an apt addition to the Pullman nameplate.